Tofu marinates in traditional Indian tandoori spices and is grilled until crispy in this vegetarian grilled tandoori-style tofu recipe. The sauce is made from yogurt, lime juice, tandoori spice, and some garlic, ginger, and salt for extra flavor. This is a good grilled tofu recipe to make on a grill pan or indoor grill rather than outdoors. Or, if you're not firing up the grill, trying baking these little tandoori tofu skewers in the oven instead (at 400 F for about 20-25 minutes; see the full instructions in the recipe note below). To make this tandoori tofu recipe completely vegan, use non-dairy soy yogurt instead of regular dairy-based yogurt. I've tested it with vegan yogurt, and it still works out just fine. Turn these vegetarian tandoori tofu skewers into a full meal by adding some eggplant chunks, tomatoes or bell peppers to the skewer. 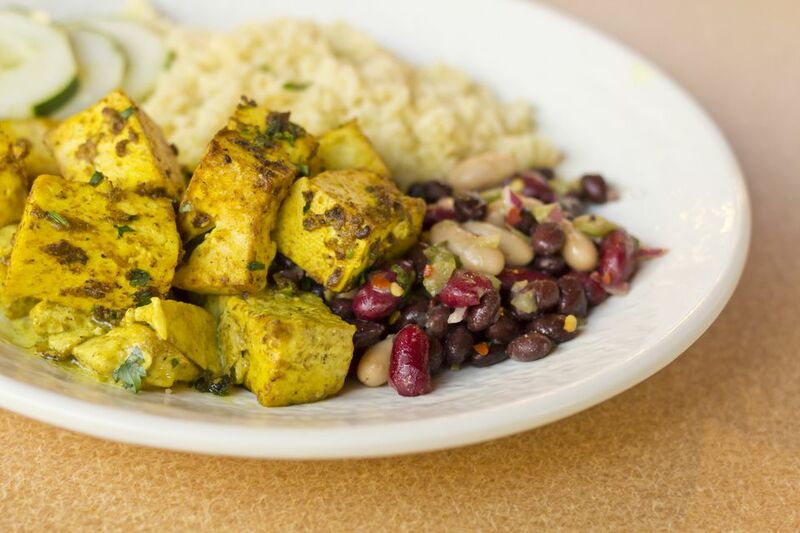 This tandoori tofu recipe is vegetarian, with a vegan option, and all of the ingredients are completely gluten-free as well. If you're looking for a simple and easy vegetarian dinner idea or just some easy homemade vegetarian Indian food recipes, this is a good one to try. Like most baked, fried, stir-fried tofu and grilled tofu recipes, this one will taste best if you press the tofu first. This allows the tofu to absorb more of the flavorings and seasonings which you add to it. Prepare the bamboo skewers by soaking them. Whisk together all ingredients, except tofu, until well combined. Add the tofu, covering well with sauce. Chill for at least 30 minutes; longer is better, turning once or twice to ensure tofu stays well-marinated. Transfer the marinated tofu to skewers, basting again with the tandoori sauce. Place on a pre-heated grill for 6-8 minutes, turning once or twice, until tofu is cooked and crisp. Pair these tandoori tofu skewers with fresh homemade cucumber raita. Recipe note: If you need to turn this tandoori tofu into an oven-baked dish because you're not firing up the grill or don't have a grill pan, here's what to do: Pre-heat the oven to 400 F, place the tofu on a lightly grilled baking sheet, and stick in the oven for 20-25 minutes, turning the pan once to make sure the tofu cooks evenly. You'll probably also want to slice the tofu into slabs instead of cubes for baking. What Is The Indian Version of American Southern Fried Chicken?